If you've ever had a rash from touching poison ivy, you know that it's quite uncomfortable. Worse, the rash, which usually appears within 24 to 48 hours after contact with the Urushiol, a greasy oil that coats the leaves of poison ivy, poison oak, and poison sumac plants, can last for up to three weeks, according to Poison Ivy.Org. Allergic reactions to the Urushiol vary widely depending on how allergic a person is to the oil. Some people experience swelling in addition to the itchy, painful rash. But, no matter how allergic you are to the oil, you don't ever have to have another reaction, according to Jim Braucker, Ph.D. who spent 25 years working as a biomedical scientist. In the video below Braucker details a simple solution that will prevent people from reacting to the oil: better washing. 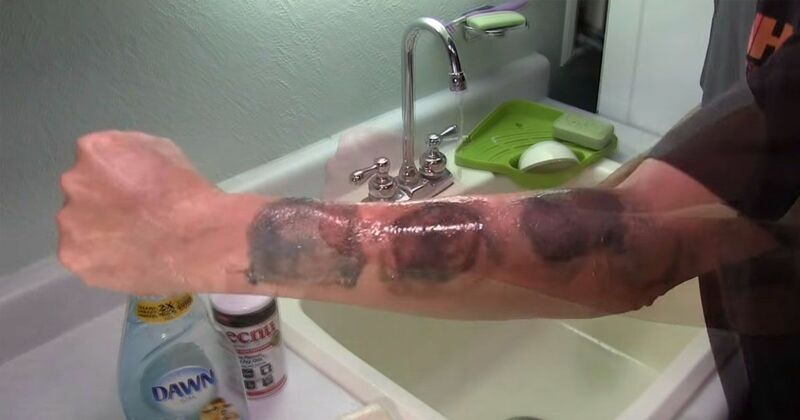 Braucker tested three different solutions: bar soap, Dawn dish soap, and Tecnu Poison Ivy Cleaner on a similar grease he'd placed on his arm. Braucker showed that the type of soap used wasn't as important as how the skin was washed. Braucker recommends using extra friction with a washcloth or loofah and scrubbing any area (arms, hands, groin, legs etc.) that may have come into contact with the oil. To prevent the oil from seeping into the skin, make sure to wash your skin within 8 hours of touching the poisonous plant. Watch the video below to see how this simple change in your washing routine could save you weeks of itchiness (and a few bucks on expensive 'poison ivy' soaps). Make sure to share this with your friends on Facebook so they can stay safe when they head out hiking this summer too!